Musical Fingers LLC’s Music Therapy program is client-centered and each session is unique to each and every client or patient. Currently all music therapy sessions occur in the homes of our clients and patients. This is for their convenience, comfort and security. A Board-Certified Music Therapist first conducts a clinical assessment to determine areas of need and establish goals. Music Therapy sessions then focus on the set goals through use of musical based activities and experiences. Responses, both musical and non-musical, are documented post-session to keep track of progress. from new approaches to the skills they have been working on. Music can be an engaging and attractive intervention for children and teens with mild and severe autism. Research has shown that 80 – 90% of individuals with autism respond positively to music as a motivator. The application of music can be used to enhance attending behaviors and reduce distractibility, and several studies have documented music therapy as a successful treatment modality to engage the child. The fact that many individuals with autism can participate successfully in music activities contributes to music therapy’s value in the treatment of autism. 1. Speech and Language skills can be greatly improved with specialized techniques. In addition, augmentative communication (sign language, PECS, computer assisted technology, etc.) can be incorporated into the music therapy session. 2. Studies have shown improved social behavior and interpersonal relationships as a result of music therapy treatment. 3. Enhanced motor coordination can be achieved through specialized Neurologic Music Therapy (NMT) techniques. 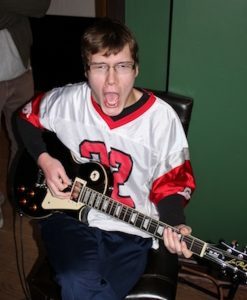 The implementation of music therapy services can enhance the individual with autism’s educational program and cater to his/her unique learning styles and needs. The music therapist provides services for each child in a collaborative effort with parents, teachers, and other therapists or professionals. 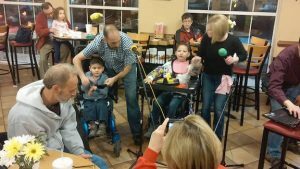 The unique components of Music Therapy address a variety of needs specific to Cerebral Palsy (CP) such as fine/gross motor development and maintenance, speech/language development, and cognitive development. Music therapists work for “success” oriented sessions. Oftentimes, children will more actively participate in motor, cognitive and speech treatments when paired with music. The fact that many individuals with CP can participate successfully in music experiences contributes to music therapy’s value in the treatment of motor, speech/language and cognitive domains. 1. Enhanced motor coordination can be achieved through specialized Music Therapy techniques. 2. Speech and Language skills can be greatly improved with specialized techniques. In addition, augmentative communication (sign language, PECS, computer assisted technology, etc.) can be incorporated into the music session. 3. Relaxation of tense muscles can be facilitated with music therapy and relaxation techniques. 4. Range of motion exercises can be paired with music in order to improve endurance and decrease muscle resistance. Children and adults are often highly motivated by music and will participate in tasks in which they may otherwise lose interest. 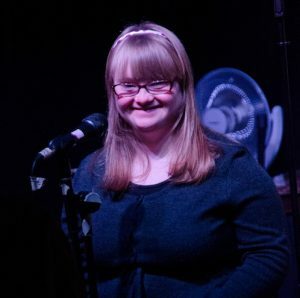 Music therapists utilize a variety of techniques to facilitate goals for individuals with Down’s. Specific strategies such as Neurologic music therapy techniques may be utilized to facilitate oral motor and speech development, fine and gross motor development, and cognitive development. disabilities meet therapeutic and educational goals. Parents and teachers report that music is one of the few interventions that a student with multiple disabilities responds to consistently. Music provides a useful and motivating way to allow for the necessary repetition for learning to occur. 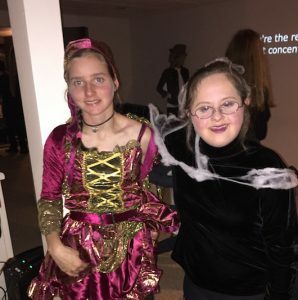 Some common goal areas for individuals with multiple disabilities include visual and tactile stimulation, language development, academic skills, and social skills. Specialized techniques can facilitate gross and fine motor skills as well. Individualized music therapy interventions are utilized to address these areas of need. Music therapy is used to improve social interaction, communication, pre-academic skills (i.e. attention span,following directions, eye contact), sensory stimulation, and gross and fine motor skills. Music therapists can address these needs by providing structured musical interventions that allow for a positive and successful experience. Adults with developmental disabilities can be seen on an individual basis or as part of a group experience. 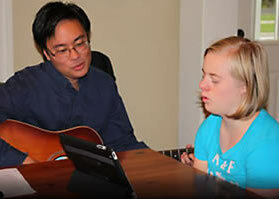 Some individuals participate in “adaptive” music lessons such as learning the guitar or piano. The music therapist structures the lessons to meet the cognitive and physical needs of the client. The goals of music therapy with emotional and behavior disorders focuses on emotional, physical, cognitive and social growth. Music therapy interventions can target long-term goals and short-term objectives to accomplish individualized needs. Individuals are encouraged to explore and express their feelings, values, ideas and opinions in the context of a non-threatening environment. Music therapy is a wonderful way to encourage development and learning in infants and toddlers. Music stimulates all of the senses and involves the child at many levels. Quality learning and participation occursbecause music is highly motivating. “The last days of living should not be seen as defeat but as life’s fulfillment. It is not merely a time of negotiation, but an opportunity for positive achievement. relaxation, etc. with the patient and/or family. Therapist can assist in planning and providing music for memorial service. Providing a positive, pleasant environment for the entire unit.